The week we will move southward from Pinecrest to North Park. These two towns interweave. The first industry we will look at is DeVillbiss Rail Service (above). There is a main shop complex (above, left) and a storage building (above, right). This industry is named for Sue Line Crew member Charlie DeVillbiss. Dillon Stokes and David Colvin. Once again, the map is designed and drawn by Sue Line Crew member Charlie DeVillbiss. it is on the backdrop! add a great deal of depth to the scene. This work was done by Sue Line Crew member David Colvin. The next industry we see the I.C. Sparks building (above). The sign and the "welder" have been added by Sue Line Crew member David Colvin. This industry is not served by the Sue Line railroad. Again we see the flats adding depth to the scene (above). we next see Garland Gun Works (above). This industry is still under construction. who is a retired probation officer. Next we see the Mason- Arizona Chemical Works (above). It is located in the middle of the north end of North Park, south of DeVillbiss Rail Service. Bob Mason of Dallas, Texas. 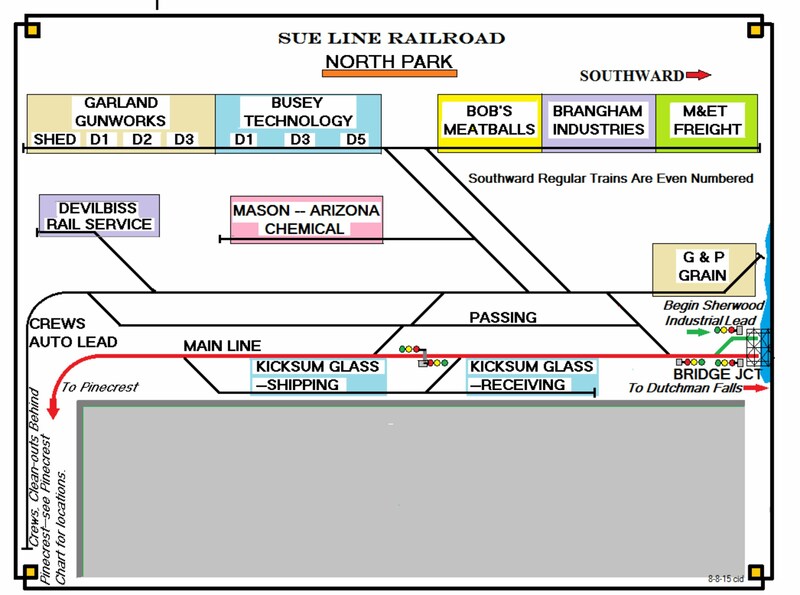 To the east of Mason- Arizona Chemical Is Busey Technology (above). The industry is named for Sue Line Crew member Jason Busey who is a medical technology specialist. with the addition of flats on the backdrop (above). All of these buildings (above) in North Park are on the photo backdrop. As we continue south, we see a combination of photo backdrop and flats (above). The flat (above, blue building) IS served by the railroad. Continuing with the backdrop, flat and now 3 dimensional structures is Brangham Industries (above). the water tower is marked for North Park (NPK). This industry is named for Sue Line Crew member Lionel Brangham. To add to the scene, LED's have been added to the photo backdrop (above). This work was done by Sue Line Crew member Craig Pearson. Marshall and East Texas (M&ET) Freight Transfer office (above). Cliff Robinson of Dallas, Texas. At the southern end of North Park is G & P Grain. Granny and Pap- therefore the G & P.
Again we see an industry on the photo backdrop (above). The south end of North Park is marked by a clump of trees (above). There is one more effect in North Park. It is the industry of Kicksum Glass. a spur for the industry. An overview of North Park looking to the south east.